Since 2016, For Freedoms has produced special exhibitions, town hall meetings, billboards, and lawn sign installations to spur greater participation in civic life. After finishing our 50 State Initiative in 2018, the largest creative collaboration in our nation’s history, we are only just beginning. Stay tuned to find out how we will continue to invite our network to play a part in helping us to reshape the cultural and civic landscape of American life. We are in the process of making a new toolkit for participating in our decentralized network of events, and invite all partners to continue to upload activations in their local community. Stay tuned for a new toolkit now that the 50 State Initiative has ended. In the meantime you can download the one below from this past fall. 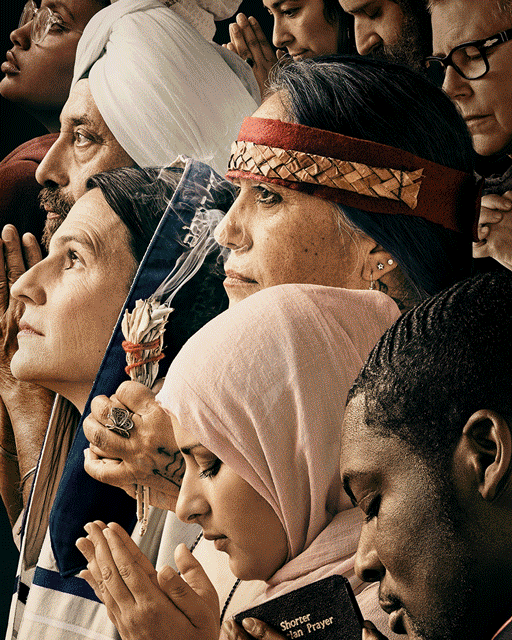 This past fall we launched a photo campaign as part of our 50 State Initiative that transforms Norman Rockwell’s depictions of President Franklin Delano Roosevelt’s 1941 address to Congress, which articulated FDR’s vision of the four basic human freedoms: freedom of speech, freedom of worship, freedom from want, and freedom from fear. Through dozens of iterations of Rockwell’s original four paintings, the 80+ images attempt to reflect the immeasurable diversity of American identities today. We are asking the For Freedoms community both to share these on social media and print out posters and put them up in your local communities. Below you can download the image files to share on social media, and download the posters to print out. For Freedoms wants to make creativity an American value. We want citizenship to be defined by the creative use of one’s voice, one’s body, one’s mind, and ultimately one’s vote. We want people to shape the cultural systems that shape their lives — politics, art, advertising, civic life — by participating in them, rethinking them, and hacking them. We also want to be kind to one another, especially when we disagree. We talk to people’s faces, not behind their backs. We are anti-violence. We are anti-partisan. We trust each other to go places we don’t know. We are for freedoms and for each other.